"An entertaining, erudite tour of the historical complexities as well as the nooks and crannies of that wonderful city -- peppered with striking quotes which make the past come alive—this book is a must-read." Formerly the viceregal capital of Spain’s vast South American empire, Lima is today a sprawling metropolis struggling to cope with a population of eight million. Located on the coast between the Andean foothills and the Pacific Ocean, it is many cities in one, with an indigenous past, an old colonial heart, the port of Callao, and turn-of-the-century quarters modelled on Paris. Leafy suburbs like San Isidro and tranquil seaside communities such as Barranco contrast with ever-expanding shantytowns.Lima has always dominated national life, as the centre of political and economic power. Long a stronghold of the European elite, the city is now home to millions of Peruvians from the Andean region as well as the descendants of African slaves and migrants from Europe, China and Japan. As a popular saying puts it, the whole of Peru is now in Lima.James Higgins explores the city’s history and evolving identity as reflected in its architecture, literature, painting and music. Tracing its trajectory from colonial enclave to modern metropolis, he reveals how the capital now embodies the diversity and dynamism of Peru itself. CITY OF HISTORY: ceremonial sites and museums of pre-Hispanic antiquities; colonial churches and mansions; the Museum of the Inquisition; monuments to the heroes of Independence. CITY OF CULTURE: pre-Columbian textiles, pottery and goldwork; Baroque architecture and art; writers such as Mario Vargas Llosa and Alfredo Bryce Echenique; painters and sculptors; a vibrant popular culture. CITY OF MULTICULTURAL EXCHANGE: the indigenous legacy; the imposition of Spanish culture; African slaves; European and Asian immigrants; mass migration from the provinces. 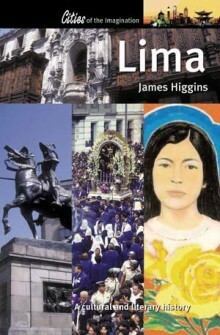 JAMES HIGGINS is an academic specialising in Peruvian literature. A regular visitor to Lima since the 1960s, he is an honorary professor of the city’s University of San Marcos and a corresponding fellow of the Peruvian Academy.